A recent study by Transparency Market Research (TMR) on the global IoT fleet management market suggests that the number of participants is growing, with International players maintaining leading positions via financial might as well as technological expertise, whereas some of the new entrants are making a mark too with their niche offerings. The TMR report identifies Cisco Systems, Inc., AT&T, Inc., IBM Corporation, Intel Corporation, Oracle Corporation, Verizon Communications, Inc., TomTom International BV, Trimble Inc., Omnitracs LLC, and Sierra Wireless as some of the prominent companies currently connected to the value chain of the global IoT fleet management market. 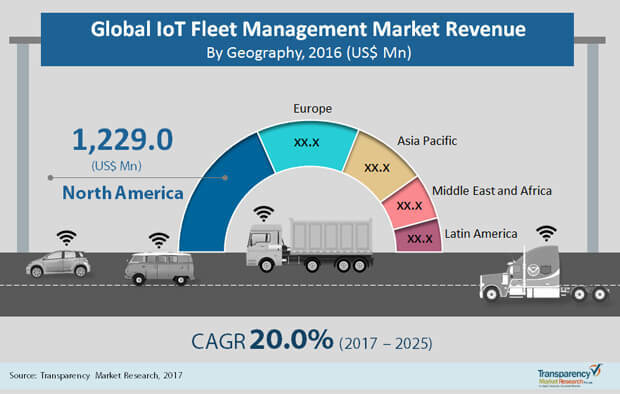 As per the projections provided by the fresh TMR study, the demand in the global market for the Internet of Things (IoT) fleet management will escalate at a highly impressive CAGR of 20.0% during the forecast period of 2017 to 2025. The report evaluates that the IoT fleet management market, across the globe, was worth merely US$3,340.0 mn in 2016, and estimates it to reach a valuation of US$15,870.0 mn by the end of the forecast period. North America, primarily the developed country of The U.S., remains the most lucrative region for the IoT fleet management market players. A number of original equipment manufacturers (OEMs) in the U.S., such as Daimler Trucks North America and Volvo Trucks, are already offering telematics solutions, both independently and in partnership with local fleet solution providers. The IoT fleet management market is in nascent stage with plenty of opportunities for technological advancements. For instance, Daimler Trucks successfully tested truck platooning concept in 2015. The government regulatory for electronic logging devices in the U.S. makes fleet management solutions a necessary tool for the vendors of the transportation sector who deal with commercial trucks. Ubiquity of smartphones has had a defining effect on the global IoT fleet management market, as an increasing number of transportation companies are integrating their tracking and monitoring, routing, fuel management, and remote diagnostic processes with it. The advent of the Internet of Things has made it possible for the automobiles to seamlessly connect to smart phones, and provide emergency roadside assistance as well as real time traffic alerts. The IoT is made up of several smart devices such as sensors, mobile devices and cameras, all of which make use of wireless technology to communicate with each other. Incorporating IoT with fleet management helps in managing fuel and labor costs, improving fleet maintenance procedures, maximizing dispatching and scheduling, increasing response times, and enhancing customer satisfaction. The growing need for optimum operational efficiencies, implementation of Eld Mandate, and other anticipated government regulations are some of the other key factors driving the global IoT fleet management market. The U.S., the most profitable country-wide market for IoT fleet management, is projected to increment the demand consistently throughout the forecast period, gaining traction from factors such as increasing sales of fleet vehicles, high adoption rate of advanced technological products, and regulatory developments by the government. As per the author of the report, growing focus on data driven services by the telecommunication service providers and increasing adoption of cloud and fog computing analytics will open new opportunities for the vendors operating in the global IoT fleet management market. On the other hand, substantial implementation cost for small and medium sized fleet owners and the lack of IoT infrastructure in a number of emerging economies are some of the restraints challenging the IoT fleet management market from attaining its true potential. Data security and concerns regarding driver privacy are other two glaring obstruction faced by the IoT fleet management market, and there is strong need to improve on these two factors for the proper prosperity of the market.